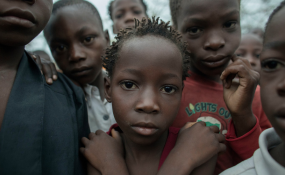 Nearly half of Cyclone Idai's victims are children. Two weeks after Cyclone Idai slammed into Mozambique, some towns remain all but inaccessible due to roads and bridges being washed away. The situation has slowed the delivery of desperately-needed food and medicine, with most of the aid arriving by air. Sarah Chiar, 42, is leaving for the first time since Cyclone Idai hit her hometown of Buzi. She says she was not able to get help before, as when the flood came she was suffering from malaria and could not leave her home. She is one of the lucky ones to receive help. The town of Buzi has been cut off from the rest of Mozambique after roads were washed away by flood waters. It took aid agencies nearly a week to begin delivering supplies to Buzi. Most of the aid has come in by helicopter, although in recent days some supplies have come by road. Businessman Ayub Fakirbai had three shops before the floods. He lost everything. He says he feels injured and disgraced. He has nothing left and says even getting food is a problem. Resident Sabe Magamboa says the cyclone has left her hungry. She says she is alone with no one to look to. She says she has a sick person at home to take care of and does not have the strength to work. The only thing she can do is walk around looking for food and if she gets a cup of rice she goes home to cook it and eats with her family. Most of the hundreds of Mozambicans killed by the cyclone lived in the Buzi district. Many of the survivors were rescued from trees and rooftops. Rosa Mandjama says she got to the top of a building after all places she thought were safe became covered by water. She says she and family members left home and headed to a nearby school, but when water came into the school they moved to the police station on higher ground and again water came in, so they finally moved to a one-story building and stayed on the rooftop. While the town recovers from Cyclone Idai, its 150,000 residents expect to depend on humanitarian aid to survive for some months to come.